A few of you have sent us, with apparent rage and glee, this screenshot of last night's draft coverage on NFL Network. What foolishness, you screamed, that the NFL's own broadcast arm would allow a Twitterer with such a handle onto its coverage! 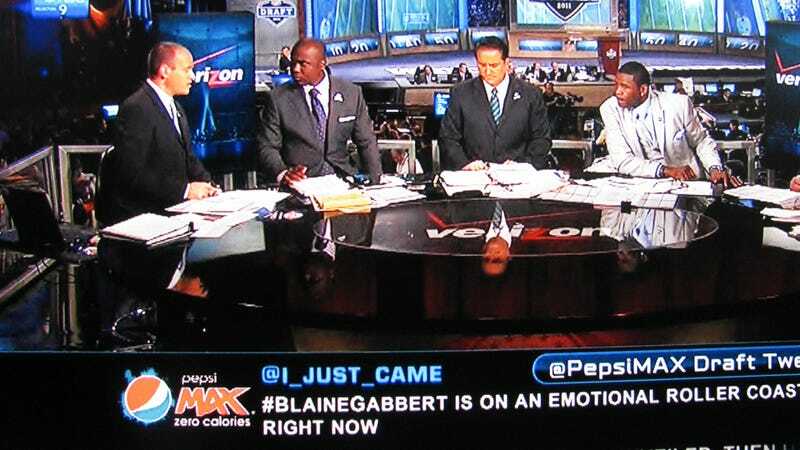 But he had an important point to make: Blaine Gabbert, former Missouri quarterback, drafted 10th overall by the Jaguars, was likely, indeed, on an emotional roller coaster. Well, today, we went in search of @I_Just_Came, soon finding that Twitter had no account by that name anymore. But we tracked him down, under his new name, @Quintero_Taylor. He tweets, "didnt like the attention i was getting from my last twitter name.."
But don't think he's not the same @I_Just_Came we once fell in love with. He tweets, "This fat girl I'm looking at so damn fine." Well said, the Artist Formerly Known As @I_Just_Came. Well said.